Enough volatility in the PRICE OF GOLD today to rattle a medieval hangman. The gold price plunged $20.90 (1.7%) and silver backed off 18.9¢ (1.23%) to $15.179. That didn’t surprise y’all, did it? Y’all knew another leg down was possible, right? The PRICE OF GOLD shows resistance/support at $1,180. A dip to that level will provoke mass puking in wastebaskets and squeeze victory shrieks out of Wall Street pimps. Ignore both and if you haven’t already loaded up on gold, back up the truck and fill up the bed, clean to the gunwales. ANY gold bought below $1,300 will look like the work of a genius time 2016 draws to its close, let alone later years. Notice I am NOT foretelling the gold price will reach $1,180, only noting that it will fall further and IF it fell to that number, it would panic even the comatose. Like pruning apple trees, the purge is needed for the growth. The SILVER PRICE cut into its 200 DMA ($15.08) today and touched its 20 DMA ($14.95) but closed higher, at $15.179. Silver keeps on lagging, so time silver purchases off gold. When the price of gold hits your target below, that’s the trigger to buy silver. $14.50 is possible. Surprise, surprise! Obama’s White House, reporting through a cloud of funny-smelling smoke, announced today in its Economic Report of the President that the US economy is jes’ fine, jes’ fine, with unemployment falling and wages rising. This is a conclusion only a government or fed economist could reach, with labor force participation still at 1978 levels. Sure, unemployment is down, because folks have dropped out of the labor force and given up on ever finding a job. But everything’s still hunky-dory, if that dirty congress will jes’ pass more job-killers like Obamacare and the Trans-Pacific Partnership, and reform criminal justice and train everybody to use a computer. The USA will one day have the most well-trained and educated jobless computer-jockeys in the whole wide world. The US dollar index, an index of the exchange rate of the ridiculous simulacrum we use as money, rose 77 basis points today (0.79%) to end the day at 97.37. This makes the same sense as falling the same amount, since the US dollar has no intrinsic or convertible value in any event. Truly ranks as the greatest fraud and con game in world history. Having explained what a US dollar — more accurately, FERN or Federal Reserve note — I note that it has reached but not overcome the 20 day moving average (97.47). 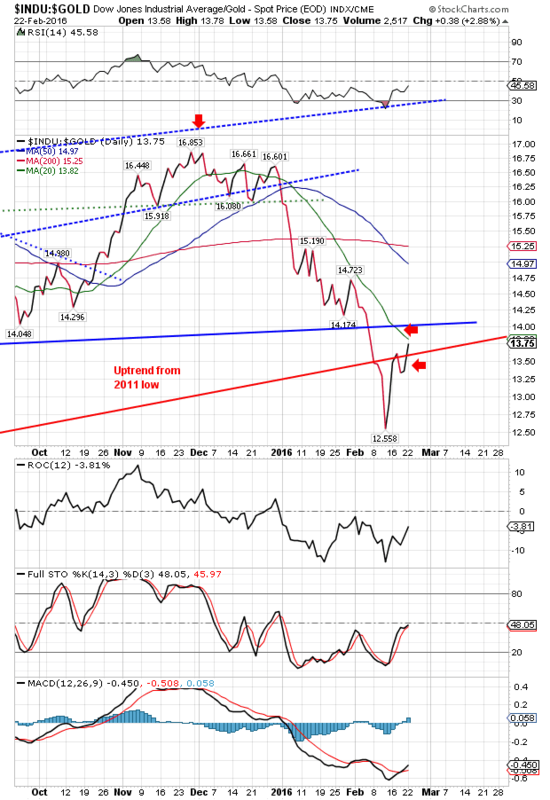 Nothing persuasive happens for the dollar until it closes above 98.15, the 50 DMA. 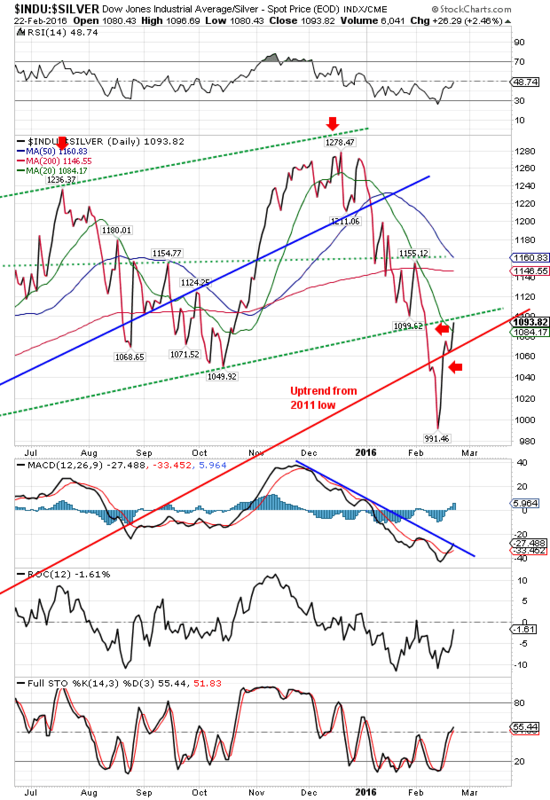 Till then it is locked in a downtrend, and even then will only have begun to whisper that it will rally. Euro remains the mirror image of the Dollar index. It fell 0.9% to $1.1029. No doubt some of that fall arose from British Prime Minister David Cameron’s jockeying over the weekend to secure Britain a better deal in the EU before a British referendum on leaving it. Be ware the stakes: the EU will crumple speedily should Britain leave. That will collapse a VERY long chain of dominoes. Yen retreated 0.22% to 88.64. Still stronger than its competitors, if “strong” is a word that can every be used in the same sentence with the name of any fiat currency. A pox on all of ’em, with chiggers thrown in for good measure! Stocks rallied strongly, continuing the handlocked trio movement they’ve been showing with the Dollar index and oil (or those have been showing with stocks). Dow augmented 1.4% (228.67 points) to 16,620.66, nor lagged the S&P500 behind, gaining 1.45% (27.72) to 1,945.50. This brings them up to resistance, and to their 50 DMAs, likely targets for failure. I won’t be much surprised either by a Niagara Falls from here, or a shot up toward 17,200 (2,000). Either way, the ultimate outcome will remain the same, much lower stock prices the rest of the year, and for years to come. Hide and watch. Higher stocks and lower silver and gold today took down the Dow in Gold and Dow in Silver, as we have been expecting. Dow in gold closed at 13.73 troy oz, just cracking above the uptrend line from the 2011 low and probably doomed to stop somewhere between the 20 DMA (13.82 oz) and the 50 DMA (14.97 oz), most likely 14.75 oz. Dow in silver is just dogging Dow in Gold’s footsteps. Rose 2.54% today to 1,094.62 oz, just above the 20 DMA (1,084.21) and of course above that post-2011 trend line. Nothing cosmic, here, just standardupward correction. West Texas Intermediate Crude oil rose stoutly, up 12.35% to $33.39/barrel, gapping up through its 20 DMA on the way. It stopped at resistance about $34.50 – 33.50. Copper also jumped 1.68% to close at $2.13, but must clear $2.15 to take itself out of Rodney Dangerfield’s class. My dear wife Susan had a good day with her eye today, a real improvement. Thanks again for your patient prayers for her.